Strategically located adjacent to the River Kwai, Sam’s House Guesthouse is well designed and equipped with excellent facilities to offer you a relaxed and peaceful experience. The guesthouse huts and accommodations are situated in a subtropical garden that is perfectly maintained to assist you relax as you comfortably enjoy your holidays. 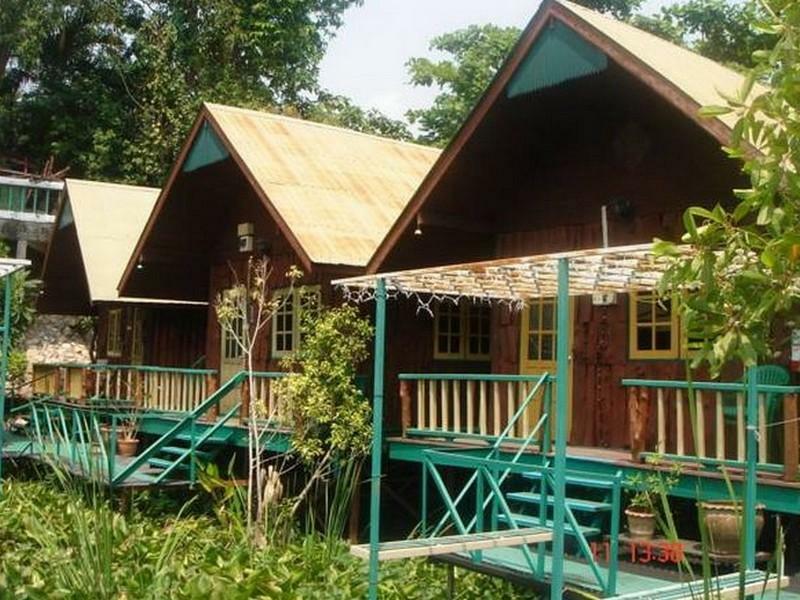 Sam’s guest house is a budget to mid-range accommodation and is conveniently located on Maenamkwa Road in the main tourist area of Kanchanaburi which is approximately 130km to the western side of Bangkok. Getting to Sams’s House in Kanchanaburi from Bangkok is really easy, either take a local mini-bus via the Khao San Road, or by local bus through the Southern bus terminal, or by train found at the Thonburi Train Station. Sam’s guest house serves as an excellent starting point for visitors with an interest of exploring the several tourist attraction sites around the area. 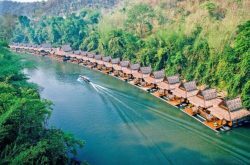 With easy access to the various national parks, Sam’s hotel Kanchanaburi is a one hour’s drive to the Erawan waterfall, only half an hour’s drive from the famous Tiger Temple and close to the River Kwai Bridge and War Museums. Sam’s House Kanchanaburi provides excellent budget to mid-range accommodation along the banks of the beautiful and peaceful River Kwai together with excellent hospitality to ensure a comfortable stay for our visitors. Featuring attractive views and tropical garden settings, our accommodation facility is installed with free WI-FI, an ample spacious parking that you do not have to ask for reservation, and a tour desk that can organize for leisure activities and rafting tours such as fishing and canoeing. Bicycle rental services as well as car hire are also provided by the 24-hour reception staff. Our guest rooms also feature fans for air conditioning, bathtubs or alternative warm or cold showers, and are spacious for you daily operations. The air conditioned raft houses and log cabins feature beautiful flooring and furnishings and are also fitted with a fridge and a seating area. These accommodation facilities are sufficiently available in various room options that are offered at budget charges. Our rooms are available in options such as the standard twin room, standard bungalow, family rooms that can accommodate up to three adults and superior bungalows. All these rooms are of different sizes and charges to allow your best choice according to the number of individuals or pricing. Sam’s Guesthouse Kanchanaburi is equipped to provide the best quality meals for visitors during their stay. Meals are provided in various preferred options, including the delicious Western and Thai cuisine. Alternatively, other great restaurants are also available within a walking distance and provides you with alternatives to the Western and Thai dishes that include, among others, fresh seafood dishes. Spending your holidays and weekends at Sam’s guest house Kanchanaburi will provide you with the perfect place to unwind and relax in tranquil settings and help you make the most of your time in Kanchanaburi. 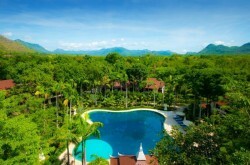 Great location on the main tourist road, close to bars, restaurants and River Kwai Bridge. Clean rooms and pleasant staff, would stay again!